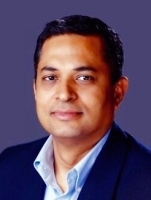 Srini is the General Manager of Microsoft Teams & Skype for Business. He is responsible for on-premises and cloud services, driving Microsoft’s unified communications & collaboration vision, intelligent communications with customers that includes cloud voice, Skype to Teams transition and delivering customer success. Srini has played several roles at Microsoft and within Office Product Group as engineering and product director for Office Communications, Lync & Skype for Business – as a founding member of Office 365, building the first version of the service, leading service engineering & product management for Skype for Business & Live Meeting services. Srini has degrees in Electronics & Communications engineering and an MBA in IS and finance from Katz School of Business.